Since 1950, the Graduate School of Banking at Louisiana State University has been a major provider of advanced financial education in the United States. Over 16,000 executives have successfully completed the program which is held each spring on the LSU campus in Baton Rouge. The School’s purpose is to fill the need for graduate level study by bank officers and others meeting admission requirements leading toward a broader knowledge and understanding of major banking functions. Completion of the program has become a requisite to professional advancement in many banks. Executives at multi-billion dollar financial institutions as well as community banks find that the School’s curriculum addresses their educational needs. because your career does not come with a guarantee. To succeed in today’s banking world, bank officers need the wisdom and expertise that comes from perception and insight, an astute ability to discover, discern and decide. It’s that kind of knowledge that the Graduate School of Banking at Louisiana State University has been offering to experienced bank ofﬁcers for 70 years. One of GSB’s most important resources is its 51-member faculty, which is composed of outstanding bankers, university professors and other professional leaders from all parts of the country. Extensive evaluations of each faculty member are conducted to assure that the most current and effective teaching techniques are employed in the classroom. The School’s informal learning environment provides the student with ample opportunities to discuss banking topics with its nationally recognized faculty. 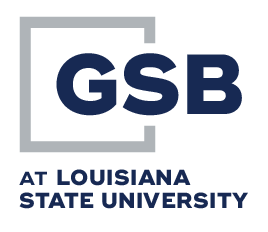 At a recent session of GSBLSU, numerous students and faculty were asked to assist future students and employers of prospective students with a provision of their insights into the program. For many of the faculty and students, their testimonials speak to blossoming professional and personal relationships with other bankers across the US and Mexico, to the power of laser-focused banking education, and to the implementation of learned methodologies once back at their home banks. But don’t let us steal their thunder. Check out our 2-minute video to experience their advice.